Impalaton is the name of a Mobile Assault Vehicle. 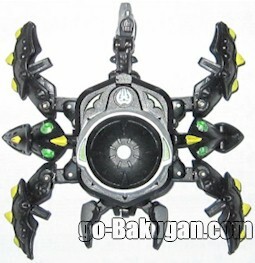 A Bakugan is placed on top of it. In real mode it looks somewhat like a scorpion. It might be used as a tank of war. It is invulnerable to attacks done without a Mobile Assault Vehicle or a Colossus. So far it is only available in Darkus, Pyrus, Aquos, and Subterra. It's Darkus version has 230 Gs, and its Aquos and Subterra versions have 220 Gs. You are able to rotate Impalaton's legs downward. Purchase Impalaton Bakugan from Amazon now!